Learn about the challenges and urgent requirements of municipalities , developers and landscape consultants working major landscaping and irrigation projects in the region. Download the brochure now to find out more. 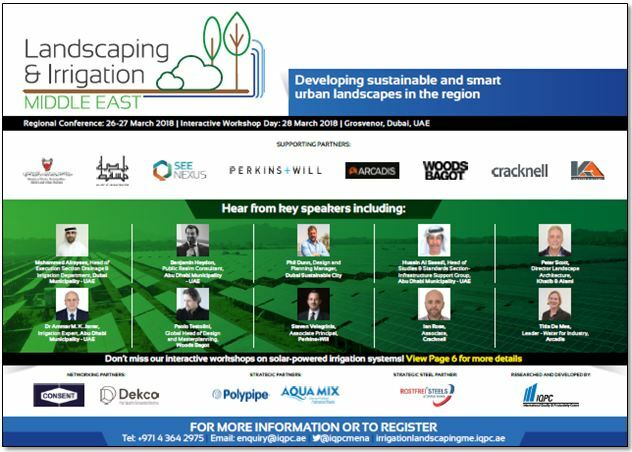 Dubai Municipality, Abu Dhabi Municipality, Muscat Municipality, Dubai Sustainable City, Dubai Properties, North 25, Khatib & Alami, Woods Bagot and more already confirmed their attendance. Email us at enquiry@iqpc.ae to receive a copy through email.